This Women’s DVD #1 presents all of the classes of the BIKINI and MASTERS BIKINI contests. 2 IFBB Pro card were awarded being to Bikini Class “C” winner Ashley Blair and to the overall winner Sonia Lewis. The 2018 IFBB Arnold Classic and Arnold Sports Festival are Presented by Classic Productions. Celebrating the 30th Anniversary of the IFBB Arnold Classic and the 12th Arnold Amateur Championships. March 1st – 4th, 2018, Columbus, Ohio. SONIA LEWIS WINS OVERALL BIKINI TITLE! 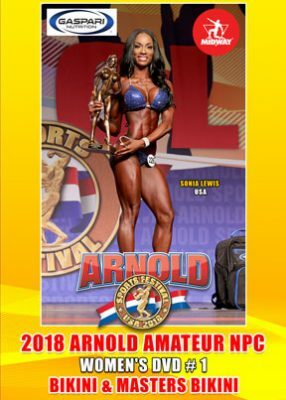 Sonia Lewis of USA won the overall BIKINI title as more than 600 of the top amateur competitors from around the world competed in 10 divisions at the 12th Annual Arnold Amateur NPC International Championships. “Athletes represented more than 60 different countries this year making it one of the biggest international events of its kind,” said Bob Lorimer, President of Classic Productions Inc. This Women’s DVD #1 of 2 presents all of the classes of the BIKINI and MASTERS BIKINI contests. 2 IFBB Pro card were awarded being to Bikini Class “C” winner Ashley Blair and to the overall winner Sonia Lewis.